Recent evidence points to a clear fact: Macs are home computers. WebSideStory's continually skewed data shows the Mac makes up only about 3% of all Web traffic. Of course, their results are based on HitBox data, which as far as I know remains a Windows-only application. (See Apple Retains Core User Base on the Web, but Fails To Take a Bite Out of Microsoft.) Of course, most surfing takes place at work. Statistics for this site consistently shows about 50% of all pages served to Macs, 42% to Windows users, and 8% to other and unknown. That's because a lot of you are surfing from work. There are two ways to look at this data. One is that Macs are no longer considered business machines - if they ever were. 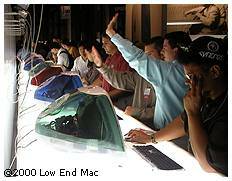 Many workplaces have abandoned or marginalized the Mac. The other outlook is that, given the choice, people who use Windows computers at work are fairly likely to have Macs at home. Thus, they buy Microsoft Office for home use. And, because most surfing is done during the work day, when a much higher percentage of users are on PCs, the Mac is underrepresented in site logs. It's not that the numbers aren't correct, but that the numbers don't correlate to the actual percentage of computers that run the Mac OS. I've got some statistics going back to 1984, the year Apple unveiled the Macintosh. Apple's highest U.S. market share, 16%, was in 1986. (Global share has consistently been lower.) These days Apple's market share is perhaps 10% of the overall personal computer market. Despite the dominance of Windows in the workplace, a lot of people are choosing to use Macs at home - I think that's part of the reason Apple "bet the farm" on the iMac . They buy Office for Mac so they can take files home from work, not because the Mac isn't a good business computer. They surf Mac sites on company PCs (don't worry, we won't tell). In short, given the choice, those who use Windows at work are far more likely to choose Macs as their home computers than market share statistics would indicate. No wonder the iMac has been such a big success against the multitude of Wintel clones. Test my theory. If Windows is the norm where you work, ask your coworkers who have home computers what kind they have. My theory predicts over 10% will have Macs at home, because Macs are great home computers.